Former premiers Christy Clark, Brad Wall and Jean Charest joined Power & Politics Thursday to discuss Ontario Premier Doug Ford's decision to use the notwithstanding clause to shrink the size of Toronto city council. All three were unanimous in saying Justin Trudeau should not intervene. Former premiers Christy Clark and Brad Wall said Thursday that they think Ontario Premier Doug Ford is justified in using the notwithstanding clause to override a provincial court ruling attempting to block the government's move to shrink the size of Toronto city council. "I think he did the right thing," said former B.C. premier Christy Clark in a panel segment on CBC News Network's Power & Politics. "I think it was an appropriate use of the power and I actually think it's a good thing for Canada because we are in a moment where Canadians are looking around and saying, 'Hey, why can't anything get done?' Well, Premier Ford has shown there is a way ... to get things done in spectacular fashion." Former Saskatchewan premier Brad Wall told host Vassy Kapelos that he agreed with Clark's assessment. "This is an important tool for premiers," said Wall. "Let's be very clear. Section 33 is part of the Constitution. And so, the availability of the notwithstanding clause to premiers is very much a part of the rule of law. It's also a part of a check-and-balance we have in terms of the judiciary and the elected legislatures and the Parliament of Canada." 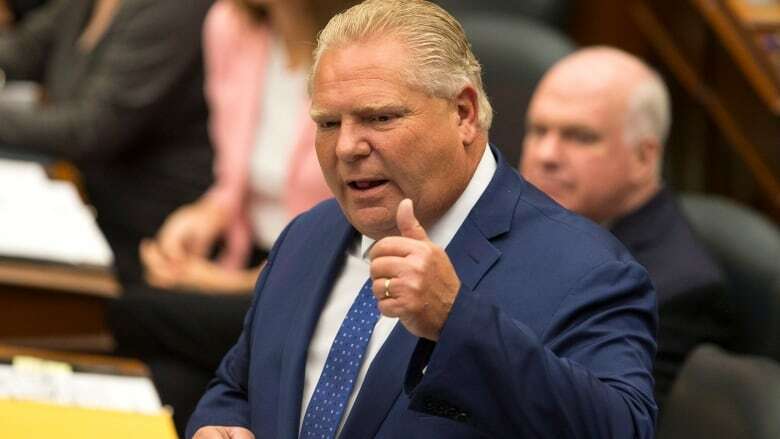 Ford announced Monday that he would take the rare step of invoking Section 33 of the Canadian Charter of Rights and Freedoms after an Ontario Superior Court judge ruled that his provincial government's legislation to cut the number of Toronto city councillors was unconstitutional. Section 33 — known as the notwithstanding clause — allows premiers or prime ministers to override for a five-year period rulings on legislation that judges have determined would violate sections of the Charter. Ontario has never used the clause before. Political leaders generally have been reluctant to use the notwithstanding clause, which is viewed by many as politically perilous. "What I've found is that if a government is going to invoke the notwithstanding clause, there has to be empirical evidence, politically, that justifies doing so. That it should not be done in an arbitrary way," said former Quebec premier Jean Charest, who joined Clark and Wall on Power & Politics. "Each premier has to determine whether or not the circumstances justify the using of the clause and whether they want to, you know, carry the onus of using the clause." Clark agreed. "It's not a legal question. It's just a political question," she said. "If I was to put myself in Premier Ford's shoes, I might have made a different decision about this, but I mean, I'm sure he made the decision because there is never a good time to reform municipal government. "It isn't up to the court to decide when the time is. It is up to the politician, the premier, who is going to be held accountable for that." Wall said he doesn't think Ford's use of the notwithstanding clause for this particular issue will set a precedent and that people who are concerned that its use will become a regular occurrence should "relax a little bit." "This is a tool that's rarely used and that's been its history since it was included as Section 33."